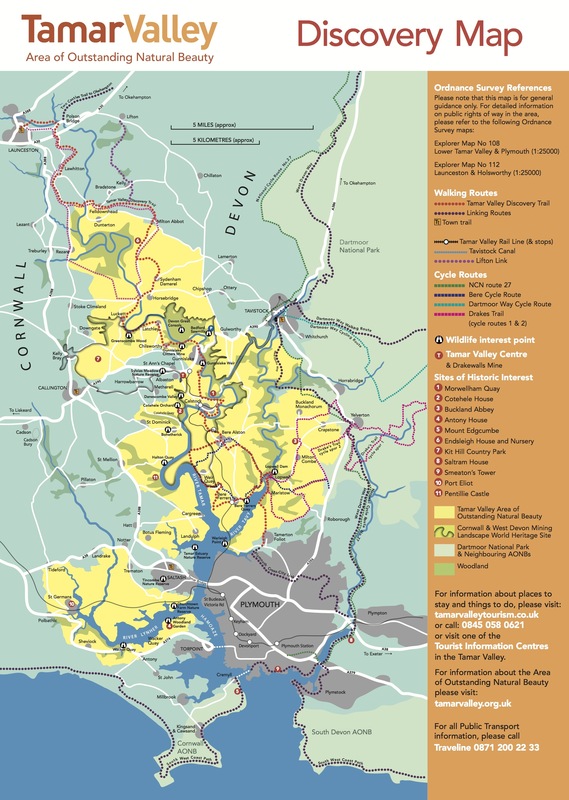 Tamar Valley | Where is the Tamar Valley AONB? Home > About > Where is the Tamar Valley AONB? The AONB boundary crosses 5 local authority areas (2 counties, 2 districts and Plymouth City), borders Dartmoor National Park and crosses 24 parishes. There are a number of routes to the Tamar Valley by car but the most direct is to take the M5 towards Exeter, then depending upon which area of the Valley you are travelling to, take either the A38 or A30, skirting south and north of Dartmoor respectively. The A38 will take you to Plymouth, the old naval city, where the River Tamar joins the sea. The A30 will take you to Launceston, the ancient capital of Cornwall. There are also many public transport links that can help you to get to and explore the Tamar Valley – CLICK HERE.